Beets; a favorite food of mine. I love them. Always have, ever since the first time I tasted them straight out of the jar as a kid. People seem to either adore them or despise them. In my experience the world is divided into two camps: Beet Lovers and Beet Haters. My next recipe is for all you beet lovers out there. A simple, yet elegant dish that is a real show stopper when used as a starting course. Although packed with nutrients and easy to put together, this dish is a real treat. 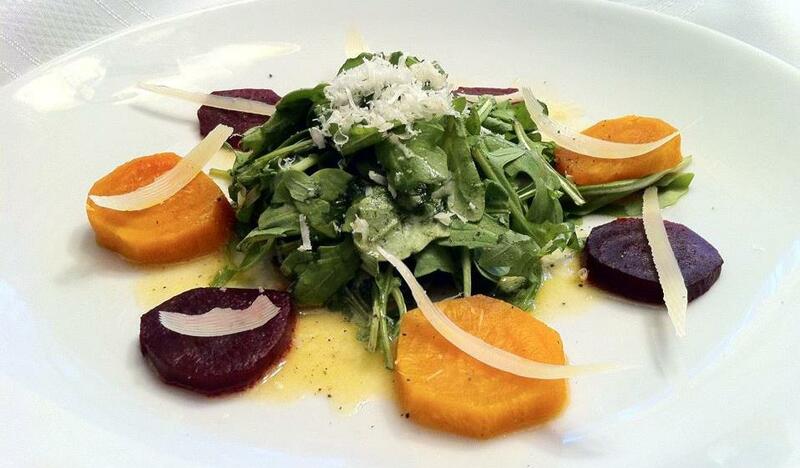 Be sure to gather a piece of arugula, cheese and roasted beet on your fork and enjoy in one bite. The earthiness of the beet, the peppery flavor of the arugula and the saltiness of the cheese are a delight when tasted together. The original recipe calls for Kefalotyri, a hard Greek cheese that I have used and is wonderful. Parmigiano-Reggiano and Pecorino Romano are also delish. 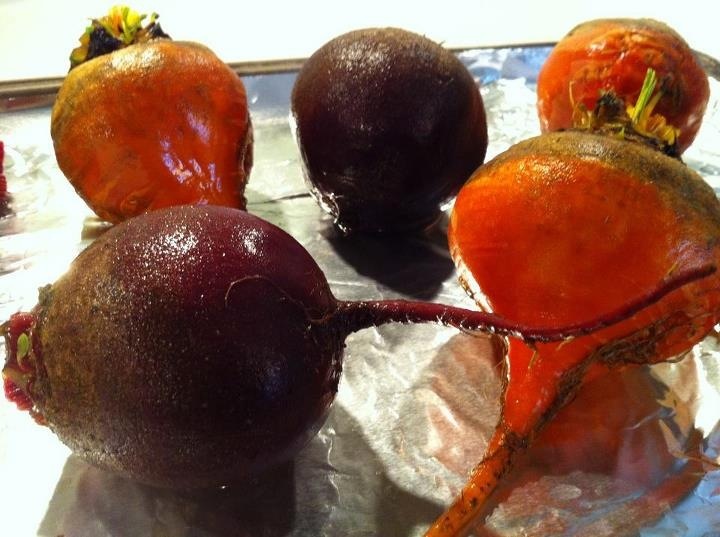 When roasting the beets, leave them in their skins with roots and stem intact. Do not be alarmed if they shrink from their skins and look overdone. When peeled, a beautifully tender and vibrant beet will be revealed. Beets can be roasted the day before and stored in their skins in an airtight container for a day or so. One tip is to wear gloves when peeling & slicing them. Although I never wear them and it hasn’t happened to me, one friend told me a tale of magenta hands that lasted for days. Good thing we’ve been pals since childhood! Preheat oven to 425 degrees. Leave on root and 1/2 to 1 inch stem on beets and scrub under running water. Place beets on a foil-lined baking dish. Bake at 425 for 1 hour and 15 minutes or until tender. Cool. Peel and cut into 1/4-inch slices. Combine oil, vinegar, salt and pepper with whisk. Arrange roasted beet slices in a single layer around serving dish. Drizzle beets with half of the dressing. Combine remaining dressing and organic arugula in a bowl. Toss gently to coat. Nest arugula in middle of ring of beets. Top with shaved cheese. Before: Washed Organic Red and Golden Beets on a Foil-lined Baking Sheet. After: Organic Red and Golden Beets Oven-roasted at 425 degrees for 1 Hour and 15 Minutes. Recipe by Joanna Weir and published in Cooking Light. 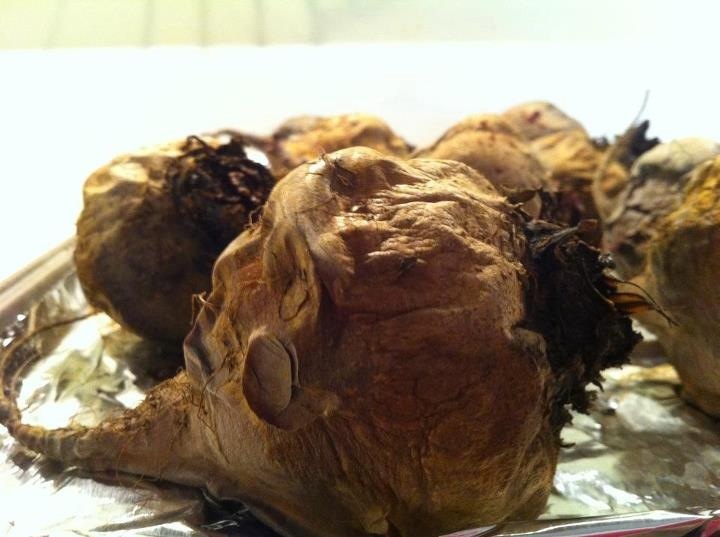 Your beet roasting method is very different from mine, so I found this very interesting. It looks fabulous.